How do you feel about Jerry Lewis? 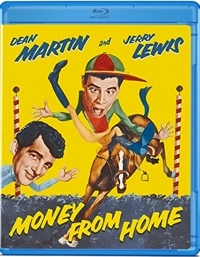 I’m not sure how families today will respond to a Damon Runyon comedy starring Dean Martin as the smooth-talking and smooth-singing crooner and Jerry Lewis as a comic manchild, but the second half of this racetrack nags-and-mobsters film really starts to gallop after a slow set-up that mostly introduced audiences to the typical Runyon stable of prohibition-era Broadway “guys and dolls.” In fact, if you like any of the film versions of his stories—Guys and Dolls, Little Miss Marker, or The Lemon Drop Kid—you’ll probably like Money from Home in spite of Lewis’s antics. Of interest, the film was made in 3D, which accounts for the lively action and some of the in-your-face shots in the third act. The characters may be as plentiful as in a Russian novel, but the plot is simple. Martin plays gambler “Honey Talk” Nelson, who can sweet talk just about anyone (women especially) but hasn’t had a lucky streak for a long time. In fact, he’s into bookie “Jumbo” Schneider (Sheldon Leonard) big-time, and Schneider gives him a choice: either fix a horse race in Maryland by making sure the “nag” doesn’t run, or else get fitted for a pair of cement shoes and find himself at the bottom of the river. Naturally he chooses to fix the race, especially since he has a dimwitted cousin named Virgil Yokum (Lewis) who is an animal lover studying to become a veterinarian that he’s sure he can con into helping him. Typical of Hollywood comedies from this period, the males and females are “paired off,” with Honey Talk falling for the owner (Marjie Millar) of the horse he’s supposed to take out of commission, and Virgil getting sweet on the horse’s veterinarian (Pat Crowley). Complicating matters, the English jockey (Richard Haydn) isn’t exactly a teetotaler, and so the plan is to keep him drunk enough to make sure he never gets on that horse. The minute you see how well Virgil and the horse get along, you know what’s going to happen. 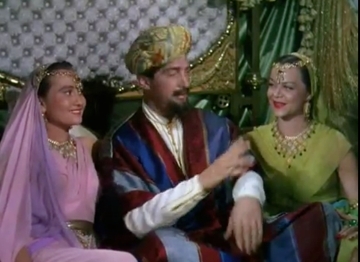 But there’s also a Poojah (Romo Vincent) who is going to buy the winning horse and brings his whole harem with him, making for additional comic opportunities. Like most comedies from the fifties, Money from Home is corny and depends on sight gags, slapstick, and a few good one-liners for comedy, but once the characters are introduced you find yourself getting caught up in the action. Apart from adult drinking and the drunkenness of the jockey it’s a pretty tame film, suitable for families. What age group will like it? That depends. What age group likes Jerry Lewis? 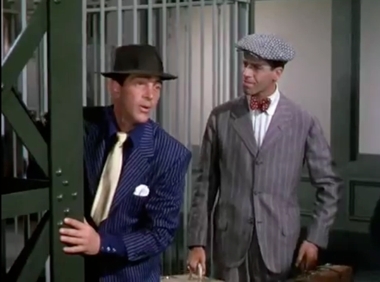 As for Martin and Lewis, this entry started them on an upswing. After Money from Home they made some of their most successful films: Living It Up (1954) and You’re Never Too Young and Artists and Models (1955). Most of the Martin-Lewis films fall in the 6 out of 10 range, which makes this film a B-/C+ or vice versa—depending on whether we’re talking about the first half of the film or the second. Watch the clip above and you’ll have a pretty good idea of whether this film is for you and your family. I think the second half is well worth putting up with a slower start.